Google+ has confirmed they will shut down on April 2nd. How do you think this will affect the gaming community, will it have any impact whatsoever? 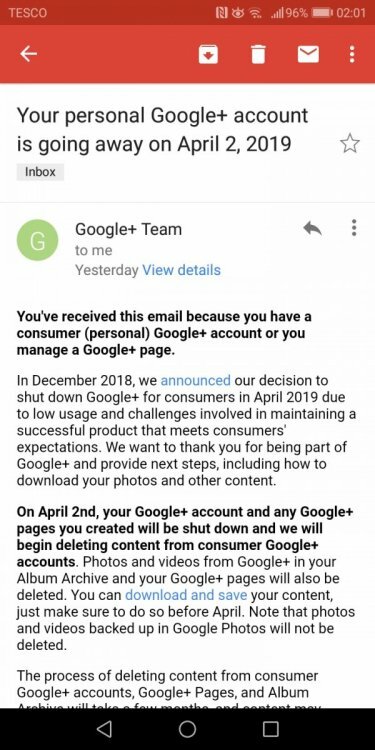 I had this email from Google not to long ago confirming they will close the social media platform. The closure may slightly affect community owners and along with the members in the gaming groups but I can't say it for definite whether the change will drastically impact a gamers life. It's hard to tell. Google+ was always redundant to me. I have never really used it for anything nor did I care about it and I am still confused about what Google was trying to do with this platform. Did anyone actually use it? Oh wow, I actually didn't know it. It won't affect YouTube or Google AdSense in any way I hope? I never really actually used it much, but I guess it's a shame that it's going away. I knew of its existence but everyone I know is still baffled as to what purpose it actually served. I think it was expected. Google does not know how to handle the social networks. They killed orkut, they now killed the google plus. I think in near future things would be lot different for them. And they may stick with their other projects based on what they have. I don't think social media is their game anymore. And they should stick with what works for them. I do have Google + place and I was very active on a couple of gaming communities on Google +. However, I was not using Google + for a long time and shutting down of Google + will not have any effect on me and my social media activity. Even though shutting of Google + was announced in December, I suspected this a long time ago as Google + did not have too many loyal users. I have expected this to happen a long time ago because Google+ seems to be a dying phase of the Google community handle. Just like yahoo messenger was scraped off and MySpace as well, now it's time for Google+ to join the cue. What does this mythical Google+ actually do? I see nothing in the history books nor does a Google search bring anything up. It's more like a Google social media site as well just like Facebook but this one is anchored on Google. But people are most used to the Google search engine and not the Google+. It's also used for gaming as well because I have so many gaming Google+ ID. I thought I'd have to go on an archeological expedition to some ancient temple to find this info🤣. As somebody else said, Google is very poor at creating social media products. They have killed off Allo, Google+, soon to kill off Google hangouts - it is just not their thing. Even though Google Plus had all the elements of facebook, it could never beat facebook, it was not even close to facebook. maybe G+ was not promoted as much as it should have been promoted. Most of us didn't know what purpose it served in the first place and most people wouldn't want to use a platform that is inferior to FB in terms of features. Yes, you are absolutely right my friend. Most people today don't even know about its relevance because it's not that popular as the other social media sites. I'm very sure it's part of the reasons why it's getting scrapped. I kind of expected that they are going to shut down. They didn't make any money. They tried to pressure the publishers to like the platform. But that didn't worked out for them. And even worst part is that they were trying to be tumblr, facebook and twitter. And that all in all did not worked out for them. It may be necessary that some of the time such social networks have to find out what they want to be.